A Fishhook Injury is a type of penetrating injury that occurs when a fishhook gets stuck in the skin, soft tissues of the hand or face. What are the Causes of Fishhook Injury? What are the Signs and Symptoms of Fishhook Injury? How is First Aid administered for Fishhook Injury? Removal techniques: When the involved part is a finger, hand, of even the face (but not the eye). Seek immediate medical assistance, if the wound is too deep/wide, bleeding does not stop, or there are any signs of infection including redness, swelling, pain, and purulent (pus) drainage. 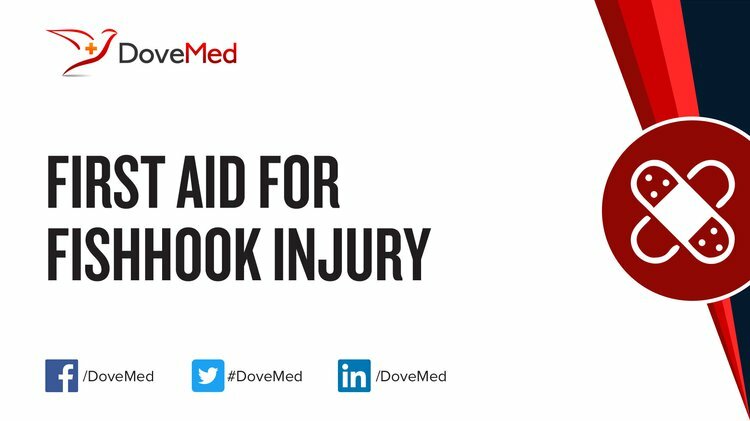 Who should administer First Aid for Fishhook Injury? First Aid can be administered by the affected individual themselves, or by any person near them. In case of fishhooks near the eye, in the tongue, genitalia, or deeply inserted into the body, a qualified healthcare professional must be sought. What is the Prognosis of Fishhook Injury? How can Fishhook Injury be Prevented? Eley, K. A., & Dhariwal, D. K. (2010). A lucky catch: Fishhook injury of the tongue. Journal of Emergencies, Trauma and Shock, 3(1), 92. Mohan, N., Sharma, S., Padhi, T. R., Basu, S., & Das, T. P. (2014). Traumatic endophthalmitis caused by Shewanella putrefaciens associated with an open globe fishhook injury. Eye, 28(2), 235. Agrawal, R., Laude, A., & Taneja, M. (2012). Fish-hook injury of the eye. International ophthalmology, 32(3), 269-271. Inchingolo, F., Tatullo, M., Abenavoli, F. M., Inchingolo, A. D., Inchingolo, A. M., & Dipalma, G. (2010). Fish-hook injuries: a risk for fishermen. Head & face medicine, 6(1), 28. Iannetti, L., & Tortorella, P. (2014). Penetrating fish-hook ocular injury: management of an unusual intraocular foreign body. Case reports in medicine, 2014. Chao, D. L., Erickson, B. P., & Rachitskaya, A. V. (2015). Penetrating Ocular Fishhook Injury. JAMA ophthalmology, 133(3), 347-348. Prats, M., O’Connell, M., Wellock, A., & Kman, N. E. (2013). Fishhook removal: case reports and a review of the literature. The Journal of emergency medicine, 44(6), e375-e380. Khan, H. A., & Kamal, Y. (2014). Fish Hook Injury: Removal by ‘’Push Through and Cut Off ‘’Technique: A Case Report and Brief Literature Review. Trauma monthly, 19(2).